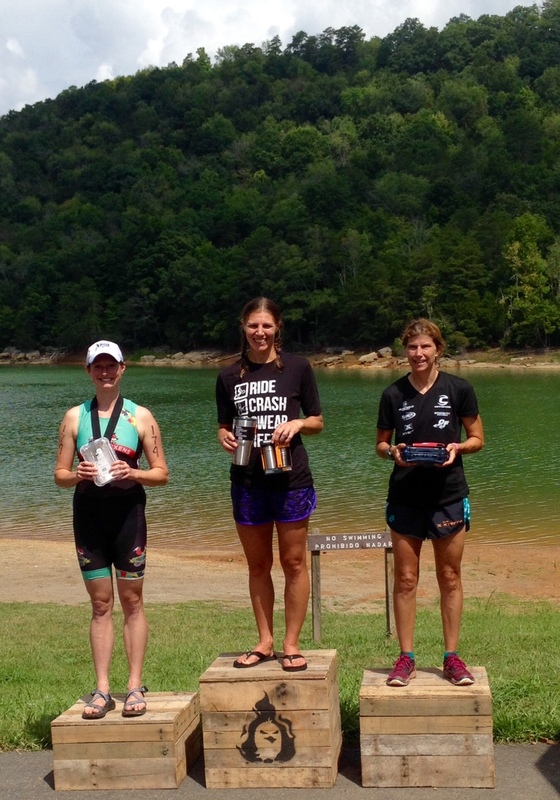 It was a day of many firsts – my first time competing in an XTERRA, riding the trails at Panther Creek State Park, and placing in the top three females overall in an athletic competition. I’ve done at least one triathlon every year for the past ten years and a handful of mountain bike races and trail races, but this was my first off-road triathlon, and I think I’ve discovered my new favorite sport. I love swimming, biking, and running and feel fairly equal at all three, but I really prefer riding and running on trails over the road, especially in the summer when the trees offer shade and the dirt doesn’t absorb as much heat as asphalt or concrete. XTERRA Panther Creek Triathlon is held in Panther Creek State Park in Morristown, Tennessee about an hour northeast of Knoxville. It was about ten degrees cooler up there, which was a nice reprieve. My husband Corbin and I made a weekend out of it and went up to visit his old college buddies in the Johnson City area before the race. He was afraid he wasn’t going to be able to race since he hurt his shoulder mountain biking at Raccoon Mountain, but he was able to modify his stroke to avoid hurting his shoulder and got third place in his age group. The .5 mile swim was two laps in the namesake Panther Creek. It was beautiful with the fog rolling in over the water in the morning. It had been awhile since I’d done a mass start for the swim, but it was a small race so I didn’t have trouble slipping into a spot where I could avoid flying arms and kicking legs. The bike ride was also two laps for a total of 13 miles. The toughest part was the wet roots. It had rained heavily the night before so the roots were really slick. I felt pretty lucky after making it through an especially slippery section on narrow trail with a steep drop off, and I thought to myself, “Oh jeez, do I really have to do that again?” Of course I flubbed it up the second time because I was nervous and didn’t want to face the consequences if my luck failed. The 4.5 mile run started on the mountain bike trails but transitioned to cross country trails. It stayed in the shade except for one section past a lively soccer match and another section over a small grassy knoll. The race was more relaxed and low-key than most triathlons I’ve competed in. There were no mile markers and no photographers. The racks weren’t numbered, so you could put your bike anywhere you wanted in transition. If you’re a triathlete like me who prefers dirt, or a mountain biker who is interested in trying out a tri, I highly recommend checking out this race next year! 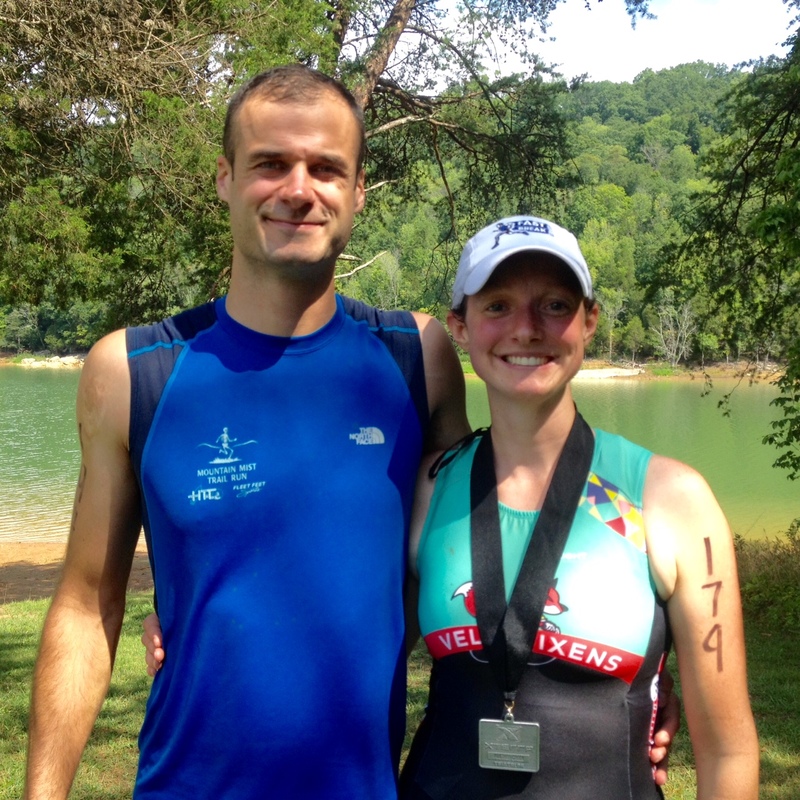 ← Waterfront Triathlon: Race team member, Cortney Geary, races again!